From June, 9 till June, 16 take advantage of 30% discounts for all annual subscription packages available with Provide Support, LLC. 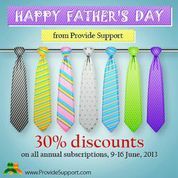 Just call to our support chat, mention about promotion, provide your promo code FD2013-B and get your 30% discount for any annual subscription package and all further renewals. We are glad to offer promotions to encourage new users join our Provide Support Live Chat Community and take advantage of best quality modern Live Chat tool for websites. We are proud of having you among our customers and will take all efforts to deliver cutting edge technology meeting your business needs and requirements. Discounts are available not only to new members but also to our existing customers who decided to upgrade. We hope this will make our service more affordable and will encourage you to upgrade and have more representatives chatting with your website visitors, improving your customer care quality and customers’ satisfaction. Just click the chat button on this blog page or on Provide Support’s website and our representatives will create you subscription packages with discount. This entry was posted in News and tagged discounts, father's day promotion, promotuin. Bookmark the permalink.